False Unicorn plant, Chamaelirium luteum, is sometimes known as Fairywand, Devil’s Bit or Starwort. False Unicorn is a famous uterine tonic herb. A tincture or tea of the roots and rhizome a modern American folk remedy for menstrual irregularity and discomfort. Also assist with the discomforts of menopause. May be a possible remedy for infertility in females. 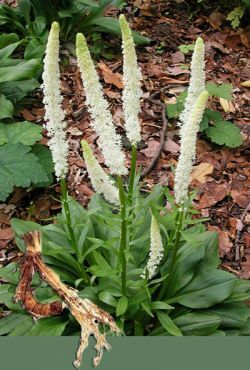 False Unicorn plant is native to North America and prefers medium to heavy moist soils in a protected, partly shaded position. Frost resistant but drought tender. A perennial, rhizome based plant growing to 1m x 0.5m. In summer it produces wands or spikes of profuse tiny yellowish white flowers. This species is slow growing and long lived. The 5 year old specimens provided are still small. Not a plant for novice growers. No credits, no refunds. Be the first to review “False Unicorn, plant” Click here to cancel reply.